Celebrating 25 Years! Recommending new books each month to spark lively conversation. Reading Group Choices selects discussible books and suggests discussion topics for reading groups. Searching is easy! Type in a keyword, phrase, or exact wording and you will be directed to the results. You can also click on “view all books” beneath the search box to run a more advanced search, and to scroll through all of the books in our database. From a New York Times best-selling author, psychotherapist, and national advice columnist, a hilarious, thought-provoking, and surprising new book that takes us behind the scenes of a therapist’s world—where her patients are looking for answers (and so is she). One day, Lori Gottlieb is a therapist who helps patients in her Los Angeles practice. The next, a crisis causes her world to come crashing down. Enter Wendell, the quirky but seasoned therapist in whose of­fice she suddenly lands. With his balding head, cardigan, and khakis, he seems to have come straight from Therapist Central Casting. Yet he will turn out to be anything but. As Gottlieb explores the inner chambers of her patients’ lives — a self-absorbed Hollywood producer, a young newlywed diagnosed with a terminal illness, a senior citizen threatening to end her life on her birthday if nothing gets better, and a twenty-something who can’t stop hooking up with the wrong guys — she finds that the questions they are struggling with are the very ones she is now bringing to Wendell. With startling wisdom and humor, Gottlieb invites us into her world as both clinician and patient, examining the truths and fictions we tell ourselves and others as we teeter on the tightrope between love and desire, meaning and mortality, guilt and redemption, terror and courage, hope and change. 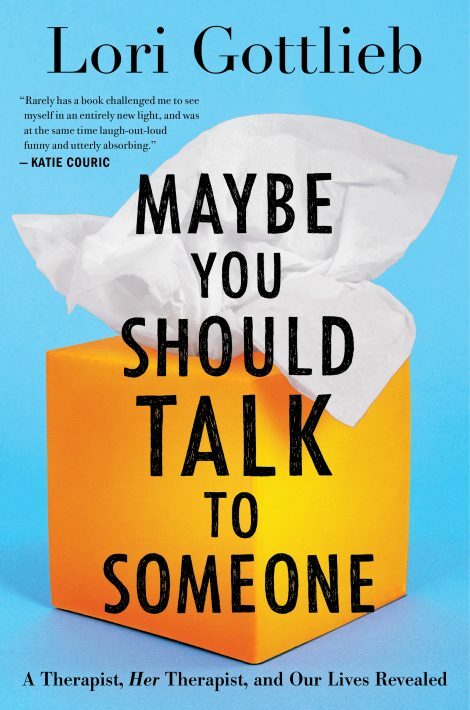 Maybe You Should Talk to Someone is rev­olutionary in its candor, offering a deeply per­sonal yet universal tour of our hearts and minds and providing the rarest of gifts: a boldly reveal­ing portrait of what it means to be human, and a disarmingly funny and illuminating account of our own mysterious lives and our power to transform them. Lori Gottlieb is a psychotherapist and New York Times bestselling author who writes the Atlantic‘s weekly “Dear Therapist” advice column. A contributing editor for the Atlantic, she also writes for the New York Times Magazine, and appears as a frequent expert on mental health in media such as The Today Show, Good Morning America, CBS This Morning, CNN, and NPR. 1. In her author’s note, Gottlieb explains why she uses the term “patients” rather than “clients” in the book, though neither quite satisfies her. What does each term suggest about the person described and the therapeutic relationship? 2. Revisit the four epigraphs that introduce each part of the book, and consider how they resonate with the stories of the patients we follow: John, Julie, Charlotte, Rita, and Lori herself. Which patient’s arc resonates most for you? 3. What does Gottlieb learn from each of her patients? In what ways does she identify with them? In what ways do you? 4. If you have a therapist, what do you think you want from him/her? Have you ever shared Lori’s experience, and that of her patients, of wanting to specific advice, or wondering what the therapist is thinking about you? 5. Is it reassuring or uncomfortable to see inside a therapist’s head? What was it like peering inside Gottlieb’s consultation group, when she and her colleagues are discussing a patient that the group suggests she “break up with”? 6. When Lori asks Wendell whether he likes her, he says that he does but not for the reasons she’s asking to be liked: he likes her neshama (Hebrew for “spirit” or “soul”). When do you see glimpses of someone’s soul? Given how much all of us share deep down in our psyches, how much do you think our souls differ? Could it be Lori’s very humanity—the parts of her that he himself relates to—that Wendell feels affection for? 7. In a funny moment in the book, Lori explains that while she’s surrounded by therapists—in her office, in her consultation group, in her friendships—she can’t find a therapist for herself because she needs the space of the therapy room to be “separate and distinct.” How does Wendell’s reaction to Lori’s crisis differ from that of her close friends, including Jen, who’s also a therapist? How might our friends’ love for us make their way of soothing us less helpful in the long run? 8. Gottlieb writes: “It’s Wendell’s job to help me edit my story” (115). How was her story about herself holding her back and how does she revise it by the end of the book? How do her patients revise their stories about themselves? Have you ever had to rewrite your own self-narrative in order to move forward? 9. Compare Lori’s and Wendell’s styles as therapists. Would you prefer one to the other? What does Lori learn from Wendell? How does her interaction with him change her own practice? 10. The ultimate concerns the psychiatrist Irvin Yalom identifies—death, isolation, freedom, and meaninglessness—are theological and philosophical concerns as well. Would you turn to therapy, religion, or another wisdom source to explore them? How might the guidance you receive from each source differ? 11. Gottlieb notes that contemporary culture is rendering the ingredients for emotional health more elusive, such as real connection with others, time and patience for processing our experiences, and enough silence to hear ourselves. Have you noticed a change in your own emotional health (or that of your loved ones) as our lives become increasingly digitalized? What do you do to offset the damaging effects of an online age? 12. Lori Google-stalks Boyfriend and also Wendell—what problems does this cause in each case? Think about the Google-stalking you’ve done. How do you feel after you’ve learned something about someone in this way? Has it helped or hurt your relationships? What does this use of the internet reveal about us? 13. In Chapter 39, “How Humans Change,” Gottlieb outlines one model of behavioral change and applies its stages to Charlotte’s case. Think about changes you’ve made in your own life. What helped you to make them? Do you recognize these stages? 14. After reading about Julie’s preparations for death, did you look up from the book and see the world any differently? Do you have a bucket list? Have you ever tried writing your own obituary? What have you learned from these exercises? 15. By the end of the book, do you feel you’ve internalized Gottlieb’s voice? Pick one of your current dilemmas and imagine what she might say about it. Are you conscious of carrying inside you the voices of people you’ve been close to? Has your conversation with those voices evolved over time? 16. What do you learn from this book that you can apply to your relationship with yourself? With others? Gottlieb introduces several psychological terms, such as projective identification (204) and displacement (367)—do you find it useful to have names and definitions for behaviors you recognize in yourself or others? If you were to put something you learned from this book into practice, what would that look like? Also, don’t forget to register for any of our April Giveaways! ©2019 Reading Group Choices. All rights reserved.